Half of the NHL regular season has come and gone. A win on January 2, 2018 versus Philadelphia kept the Penguins out of the Metro Division basement, but the team continues to struggle when it comes to stringing wins together. As it stands, the Penguins are on the outside (of a playoff birth) looking in. They will need to do some serious work if they hope to make up any ground. They are, at most, two points back from a wild card spot and six points behind the third place Columbus Blue Jackets. Even more distressing is that they are a full 10 points behind the first place Washington Capitals. The Penguins will officially begin the second half of their season with, what else, a back to back Metro Division matchup starting January 4 versus Carolina and January 5 versus the New York Islanders. Overall, they will play three games in four days going into the NHL by-week. Simply put, these are must win games against division foes ahead of them in the standings. What happens during and after the by-week is a waiting game. Trade rumors are rampant and the inability to score goals five-on-five has been a pressing issue. 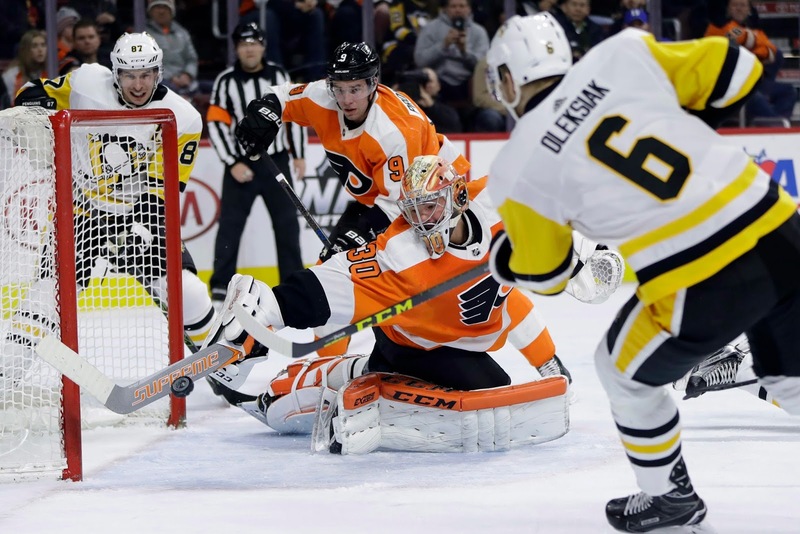 Toss in the plethora of injuries to key players such as Justin Schultz and Kris Letang (who returned to the line up versus Philadelphia) as well as gritty winger Bryan Rust and you have a formula that may take a few hours of tutoring to figure out. Forward Carter Rowney left January 2nd's game early and did not return, as did Brian Dumoulin. Neither of their injuries are known nor is what length of time they may miss from the line up (if any). Tristan Jarry also sustained what looked to be a hand injury. To the Penguins favor, the by-week allows time for healing without the worry of games missed. It also allows time for a little soul searching and mental resetting. As we have seen in the past, the Penguins are capable of pulling themselves out of a funk and just in the nick of time. Do they have enough left in the tank to do it again with the fatigue of back-to-back Stanley Cup runs still looming over them? Will they have any left over to try and make history yet again? The answers are coming but who answers them could be a different story.